The first cathedral on this site was established by Bishop Oswald in 983 but was partially destroyed in 1041. It was re-built by Bishop Wulfstan on the banks of the Severn between 1084 and 1375. 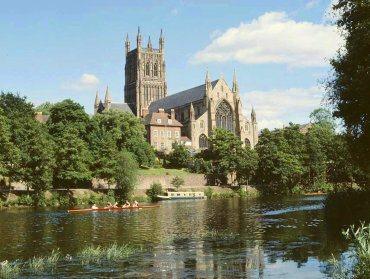 This cathedral is the final resting place of King John, of Magna Carta fame, who died in 1216. This view is from the north-west. The boat in the foreground is a 'Narrow Boat' originally built for commercial use on the canals but now used mainly as pleasure craft. 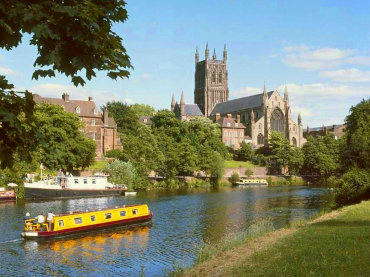 Built by John Gwynn in 1781 this carries the road from Worcester to Hereford. 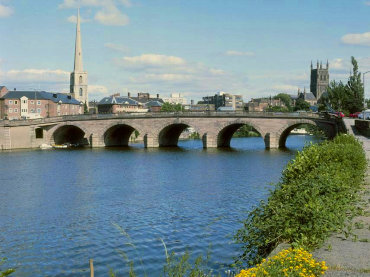 The River Severn is Britain's longest river. It rises in the mountains of Wales and follows a roughly semi-circular route for over 200 miles before reaching the Bristol Channel and the sea . The cathedral tower can be seen on the right of the picture in the distance.